Most commonly these dogs and their owners visit elderly, children and disabled people in e.g. different institutions, schools and day care centers. In addition, care dogs may visit e.g. mental health patients, people in need for rehabilitation, war invalids or autistics. The activity is based on volunteering, thus the care dog instructors do not receive monetary compensation. A care dog is a healthy adult dog with sufficient life experience of different people, places and situations. The dog has to get along well also with other dogs, as care dogs usually work in groups of 2-6 pairs of dog/instructor, depending on the size of the destination of the visit. The dog should be suited for the task by its nature and be friendly and naturally interested in people, as the dogs are not specifically trained to be care dogs. A need for all types of care dogs in different sizes and breeds exists as depending on the clients’ preferences every dog has a special place in somebody’s heart. 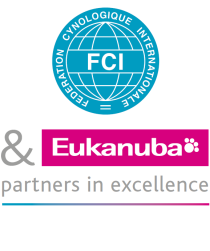 To be eligible to attend care dog activities, a care dog instructor needs to attend a 2-day training organised by the Finnish Kennel Club which includes evaluation of the dog for the task in addition to theory. Due to this procedure it is possible for the inviter to know that teams working under the Care dog-title act according to same practices and instructions. The attire of The Finnish Kennel Club’s care dogs consists of an orange scarf on the dog and a badge on the instructor. The positive effects of animals on human well being and health have been known for a long time, but only the scientific research results of the last decades on the subject have made animal-assisted therapy methods scientifically approved. Several studies have proven the positive, short-term relaxing effects that the touching of and mere presence of an animal may have on a human. It has also been proven that even long-term effects on human well being may be achieved through animal-assisted therapy. The Finnish Kennel Club’s care dog activities are expanding continuously. At the moment there are almost 1000 registered care dogs and instructors which work in 65 different visitor groups all over Finland. There is plenty of interest and demand for care dog visits and the awareness for the activities is growing. The Finnish Kennel Club’s care dogs are bringing joy to the life of thousands of people every week and simultaneously bring positive media coverage for Finnish dogs. In case similar type of activity exists in your country we would be delighted to hear more about it.